Takeaway: In the wake of changing technology and an explosion of digital options for shoppers, the consumer the new point of sale. Today’s brands and retailers must enact consistent product content management across a wide variety of digital channels. We know with distributed commerce, the number of ways we interact with consumers has grown and become more direct and intimate. Products appear in Facebook feeds, Pinterest boards, within ingredient lists on recipe websites, and in editorial links within blogs and design-planning websites. Instead of the consumer coming to your digital platforms to shop, today’s shopper expects to buy wherever they are browsing and demands the product and content experience to be consistent. So it becomes, being where your customers are and presenting them with product information are the top priorities. The keys are to focus first on developing product content and strong merchandising strategies, then on smartly distributing products across commerce sites and platforms like those below. 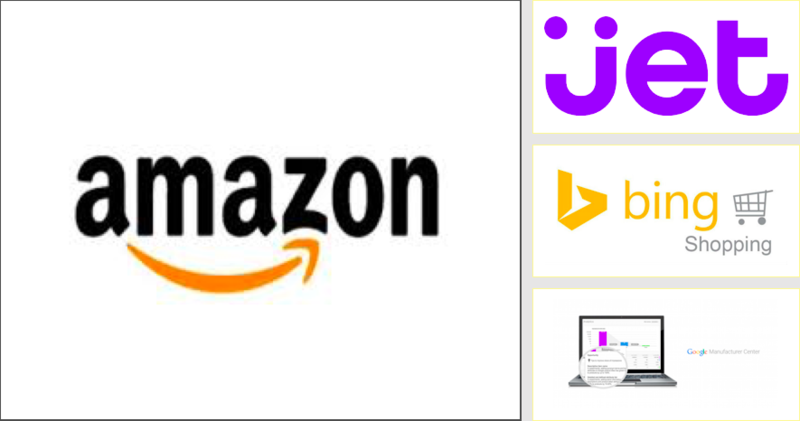 Google Manufacturer Center, Google Merchant Center, Bing Shopping, Amazon, and Jet are all hugely prominent ecommerce search platforms that reach millions of consumers daily. Use these giants to gain exposure, boost your overall brand image and top-line sales by maximizing the tools they offer. An example from Winning at Distributed Commerce illustrates the success that comes from featuring solid product content on these platforms: When Speakman shower and bath products adopted Google’s Manufacturer Center early on, they uploaded rich product content and spread it across Google Shopping ads. Google was able to “increase relevancy for users querying against Speakman product categories,” which ultimately led to an 8.1% increase in purchase conversions over a three-month span. If done correctly, placing product content and buy buttons on social media – Instagram, Facebook, Pinterest, YouTube – is the epitome of being where your consumers are. The brands that have managed to place products based on consumers’ interests, without being invasive, obvious, or annoying, have seen success. The caution here: Go the extra mile for the consumer and don’t be lazy. Consumers are discerning and as soon as they catch whiff of an unwanted ad, most flee the other way. Simply plopping a retargeting mechanism into the consumers’ feeds and overt in-feed distribution will often be met with shopper apathy. As Nielsen found, “Trust in editorial content has [fallen] over the past two years, dropping by 8 percentage points to 54%.” In other words, the shopping experience must appear as a matter of convenience only, not brand promotion. Some grocery chains, like Publix, Walmart, and Target, have placed buy buttons and promotions within the ingredients list on AllRecipes.com, a prominent recipe search site, allowing the consumer to get a head start on sales on products they intend to purchase anyway. A single click lands the consumer on the brand’s or retailer’s product page enticing the shopper to buy online, pickup in store. Links to product pages within blogs, community style sites like Polyvore, and design-planning websites like Houzz, have the same effect. The consumer is already in a state of mind where they are open to suggestions, with shopping the next step in their journey. 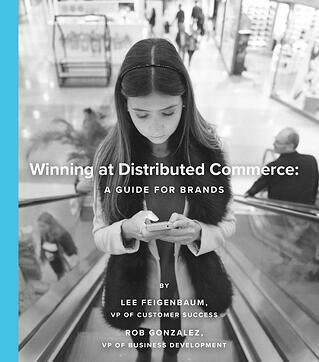 Get our complete guide to the way that brands should implement people process and technology to win at distributed commerce.